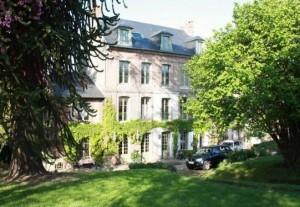 Bed and breakfast accommodation in Honfleur – new! We already work with a few establishments in Honfleur. However, they all get booked up so quickly that I couldn’t turn down this accommodation when they approached me for inclusion in our portfolio, particularly when I saw their glowing reviews on that well known traveller’s review website. It’s a wonderful old building, perched on the hillside amidst acres of parkland, just a short walk from the old port of Honfleur. The building has been painstakingly restored to its former splendour and no expense has been spared in the comfort of the guest rooms. Everybody talks about the breakfasts here which have to be taken to be believed! As for the welcome? Well, judge for yourselves! Click here or on the photo above to view full accommodation details and then click the ‘enquire for availability’ link to make your request for specific dates.